Kim Hunter once owned a popular Korean restaurant in a trendy area of downtown Raleigh before making the decision to close and take her food to the streets. She enjoyed owning a successful restaurant, but she wanted more flexibility. Her stationary restaurant found itself susceptible to a constantly evolving downtown, and with this comes traffic changes, construction, and parking challenges. Hunter now avoids these rapid disruptions with her mobile eatery, Umma Foods. Many chefs like Hunter are deciding to forego traditional brick-and-mortar establishments in favor of a traveling restaurant—with far less overhead and restraints. With this shift in dining options, hungry customers are taking advantage of the convenience, variety, and novelty of food trucks to experiment with foods from around the world. “Having a food truck allows more flexibility, both in my personal life and in where we can connect with customers. We aren’t constrained to a particular location,” Hunter says. Hunter often finds herself parked in one of the many Triangle breweries, such as Trophy Brewing and Bond Brothers Beer Company. She’s also been booked to park her truck and cater weddings, birthdays, and corporate parties. With her mobile kitchen, she’s able to introduce her international cuisine to a larger area of the city. One of the perks to operating in such a small space with few staff is the connection between chef and customer. “On the truck, I am directly involved in every interaction—from greeting the guest, talking with them about the menu, taking their order, and cooking it. I enjoy that level of interaction,” Hunter says. The food truck evolution has changed the way people eat out. So much so that it no longer appears to be a trend. Those seeking a quick and convenient international experience, instead of spending hours at a traditional restaurant, are finding themselves drawn to experimenting with different cuisines at food trucks. “Enjoying food is about the experience. And people are interested in finding unique experiences and trying new cuisine. Food trucks come from the idea of international street food and, when done well, food trucks give people that sense of being on a street or festival in a town in a faraway place,” Hunter explains. While food trucks might not create the same ambiance people get with a sit-down restaurant, Hunter says there are ways to create a unique and special atmosphere. 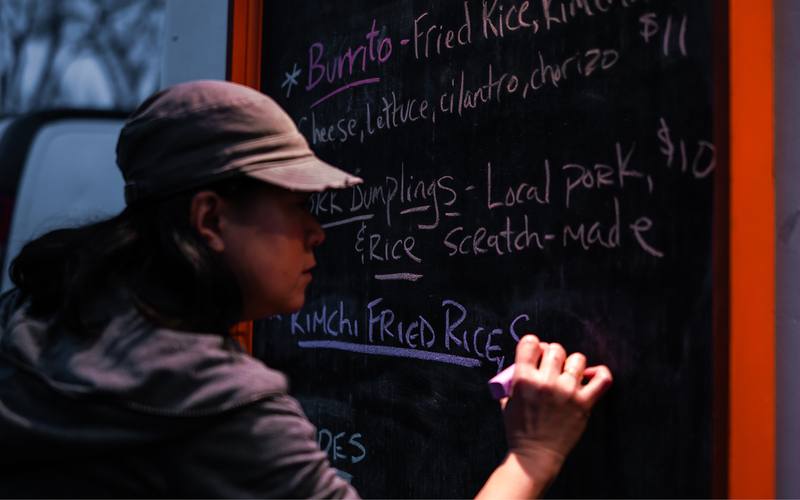 Her Umma Foods truck brings a Korean vibe into the experience through the signage and menu, customer service, plating, the locations or setting where the truck is parked, and, of course the food itself. Jeff Clement has been a food truck enthusiast for years. He enjoys waiting among fellow foodie comrades in long lines to try a new and popular food truck. He’s particularly interested in foods with an international flair. Clement enjoyed chasing after food trucks so much that when it came time for him to retire from the advertising agency world, he decided to join his friend—and food truck owner—this past summer to travel throughout St. Paul feeding hungry Minnesotans. “What I like best about international trucks and doing international foods as specials is it creates a perfect environment and intersection where consumers can try new foods with limited risk or commitment,” Clement explains. When Clement helped his friend on the food truck, Signature on Wheels, his goal was to enjoy and immerse himself in his passion for cooking and introduce people to the delicious foods he’s tasted while traveling the world with his family. Some of his favorite dishes to prepare were peri peri chicken from South Africa, Goan shrimp and tandoori cauliflower from India, Korean barbeque beef tacos, and Croatian lamb kabobs. While Clement might be retired from advertising, the practice is still ingrained in the way he thinks. Not only did he help create interesting foreign specials for Signature on Wheels, he branded them World Food Adventures. He even created a Facebook page and the website worldfoodadventures.com, with the goal of eventually expanding to partnerships with other food trucks. If you can’t find a food truck offering a variety of cultural cuisines, like Signature on Wheels, attending a food truck festival or event where multiple trucks are parked allows for even more freedom to experiment, with minimal risk and cost to the customer. If you’re with a large group, it can sometimes be a challenge choosing a restaurant to please everyone; a festival could cut down on conflict. Also, if you don’t like what you’ve just eaten, you can move along to a different truck without the regret of putting all your hopes into one dish and having to leave hungry. The risks chefs face when trying to decide on menu options might become less risky when operating out of a food truck because they have a direct and immediate connection with the customer. They can see how they’re interacting with their food, and depending on the reaction, they’re able to adjust their menus accordingly. Cooking from a food truck can also offer a level of satisfaction they might have missed out on, if stuck in a busy kitchen without a visual of their customers. Chefs wouldn’t have to rely on an intermediary, such as a waitress or waiter’s observation. Dining at a food truck lends itself to comingling with strangers while waiting in line, versus if you were at a traditional restaurant. And since there’s no hostess to provide separate seating, you could find yourself sitting family style at a picnic table or side by side on a street curb, among new friends, enjoying a shared international cuisine experience. The thrill of the hunt is part of the attraction to food trucks. Discovering where your favorite trucks are going to be parked next adds an additional element of excitement to the dining experience. It can also take you to new locations you might never have journeyed to. Social media has played a large part in the popularity of the food truck revolution. After all, following a food truck via Facebook or Instagram and the actual act of eating at a food truck are inherently more of a community experience.